To audiences expecting a stodgy, puritanical old-Hollywood romance, It Happened One Night can be a pleasant surprise. Produced just before the film industry’s revamped Production Code—the censorship rules that preceded today’s MPAA rating system—began being enforced in 1934, the film gets away with material that would have been verboten just months later. 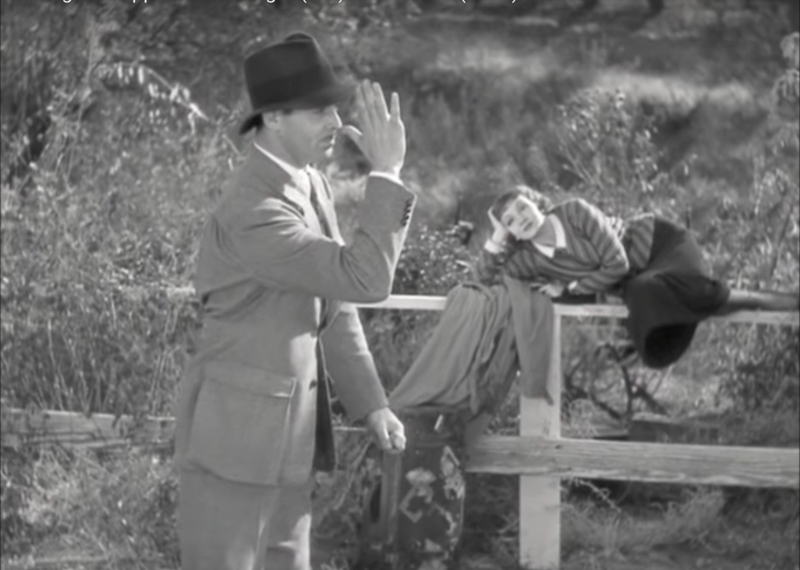 The Code would have prohibited many scenes in the film that suggest that the romance between Peter [Clark Gable] and Ellie [Claudette Colbert] is driven by sexual attraction and desire, such as the tantalizing “Walls of Jericho” scene. If the film were produced after the early months of 1934, it is also less likely we would have its most sensational scene: the famous hitchhiking sequence. The scene is structured as a joke, opening with a set-up that establishes a situation and culminating in an abrupt punchline that undercuts that situation, surprises the listener [or in this case, the viewer], and exposes the underlying concept of the joke. That punchline, of course, is the moment Ellie lifts her skirt to show her calf and a car immediately halts to pick up the pair, undermining Peter’s cocksure, masculine confidence that he is in control of their trek—and their romance. Although Ellie seems to actually be uncomfortable, her witty complaint here is no longer genuinely antagonistic; her barbs have taken on a more ironic tone, and Peter takes them in stride, observing simply that there are no cars out yet. Ellie suggests that they turn off the road and wait for the cars, and Peter silently acquiesces. Ellie exits the shot, screen right, and the film cuts to a new establishing shot—now in studio space—as she raises herself to sit on a fence on the side of the road. Peter walks from the extreme foreground toward the fence a few feet away and sets down the suitcase he’s carrying. The film cuts to a medium-long shot of the couple as Peter sits on the luggage. We’ve been moved back to a traditionally structured Hollywood scene, complete with the false shrubbery. The action that follows expresses the couple’s growing cooperation and interdependence, which, in their side-by-side strolling, we’ve already seen a visual representation of. Ellie complains of having straw stuck in her teeth, reminding us of the night they’ve spent sleeping among hay barrels—during which we got a particularly radiant close-up of Colbert’s face, reflecting Peter’s burgeoning attraction to her. Now, however, Peter willingly comes in for a less glamorous view of her face, helping her pick the hay out of her teeth in a close-up. The film cuts back to a medium-long shot as the characters pull back from each other, and the following moments remind us of the class difference between the two of them, which in It Happened One Night is always overwritten with gender difference as well. Peter plucks a carrot out of the ground, skins it with his pocket knife, and begins munching on it. Ellie is shocked that anyone would eat a raw carrot, much less one found by the side of the road, and Peter takes the opportunity to tease her about her family privilege. We are reminded that while Peter is a man of the world, Ellie is sheltered and naive—and just at that moment, we hear a car whiz by. The characters look off screen left, and Peter stands up, but the reverse angle shows us it’s too late: the car has sped away while the couple was bantering about raw carrots. Peter castigates Ellie for talking too much, and avers that catching a ride is simple as long as you know how to handle it, doubling down on his braggadocio by claiming he plans to pen a book on the topic. Ellie takes this opportunity to return Peter’s ironic ridicule: “There’s just no end to your accomplishments, is there?” Ignoring—or not picking up on—Ellie’s mockery of his performative suavité, Peter extols the superior virtues of the “thumb” method, and steps forward toward the road to demonstrate them. His stride toward the road is depicted from a new perspective, with the camera positioned just ahead of them on the roadside, so that Gable is walking toward screen right. This perspective is directly on what is called the “axis of action,” or the invisible line drawn between the active characters of a scene. There will now be two axes, however, that between Gable and Colbert as they continue to banter, and that between the cars and Gable—we might just call it the road—as they approach. A cut-in to Ellie alone has her answer, “Well, when you get to 100, wake me up,” as she lies down on the top bar of the fence. The film returns to the shot from a little bit down the road, where we can see, from right to left, the oncoming car, Peter standing on the edge of the road, and Ellie in almost another space altogether, lying among the foliage on top of the fence and watching his futile and increasingly desperate performance. Back in the medium-close-up from across the road, car after car races past Peter, who eventually applies his skilled thumb to his nose, taunting the final driver. “I’ll stop a car,” Ellie retorts, “and I won’t use my thumb.” The camera returns to across the road and, as if she summoned it, we hear another car approaching. Ellie advances to the road and, shockingly, lifts her skirt above her left knee, extending her stockinged leg almost into the road. A medium close-up shows Peter standing and staring in shock, but the film quickly returns us to a close-up focusing on the exposed gam. We see the driver’s foot and hand slam on the brakes, and the tires skidding to a stop. 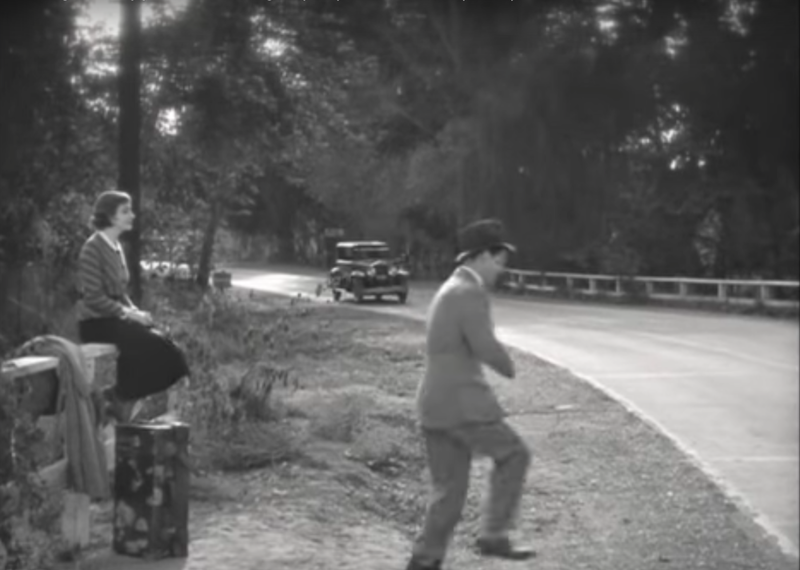 Here is the punchline to the joke: despite all Peter’s technical bluster about hitchhiking technique, nothing can stop traffic like Claudette Colbert’s calf. In one fell swoop, Ellie has proven not only that she, too, has the mettle required for the road, but—importantly for the larger story—that she, too, is a sexual being. In this scene, she steps forward from a supine position in the background among the trees to center stage, in control of the action. The scene also mirrors the earlier “Walls of Jericho” sequence in that she, like Peter, has exposed a sexualized part of her body to prove a point. It signifies a development in her character, as well as in her relationship with Peter, but it is important to note how this scene makes her agency contingent on her sexualizing her body for the film viewer. While Peter’s comical striptease in the motel room is directed at Ellie—he is looking at her the whole time, his body is facing her, and the sequence is depicted from a single two-shot—Ellie’s exposure is not directly to Peter but to a second and third audience: the driver on the road, but also the audience in the theater. The close-up on the shapely leg is for us. Whereas the person looking [half reluctantly] at Peter’s torso in the motel room is Ellie, the angle of the close-up on Ellie’s leg is not motivated by any character in the film itself, but is presented for the viewer’s pleasure. The joke, like the cinema, is ultimately intended for [straight] men. For Ellie/Colbert, claiming some degree of agency, sexual or otherwise, means stepping onto the stage the scene has constructed and turning herself into a striking image. She can advance from the static, idealized background image, but in doing so she is only stepping into another kind of image. While pre-Code fare like It Happened One Night is remarkable for often allowing glimpses of feminine sexual agency and hints of egalitarian romance, this classic scene illustrates the ways in which even these films were a few notches short of utopian.